A wort chiller is a device used to rapidly cool the wort after the boil has completed. Typically the wort is knocked down from boiling temperatures to less than 80° F as quickly as possible so that yeast can be pitched. Once the wort falls below boiling temperatures, it becomes susceptible to bacterial and wild yeast contamination. It is important to get the wort below 80° F without splashing or aerating it too much, as hot side aeration can oxidize your wort above that temperature. 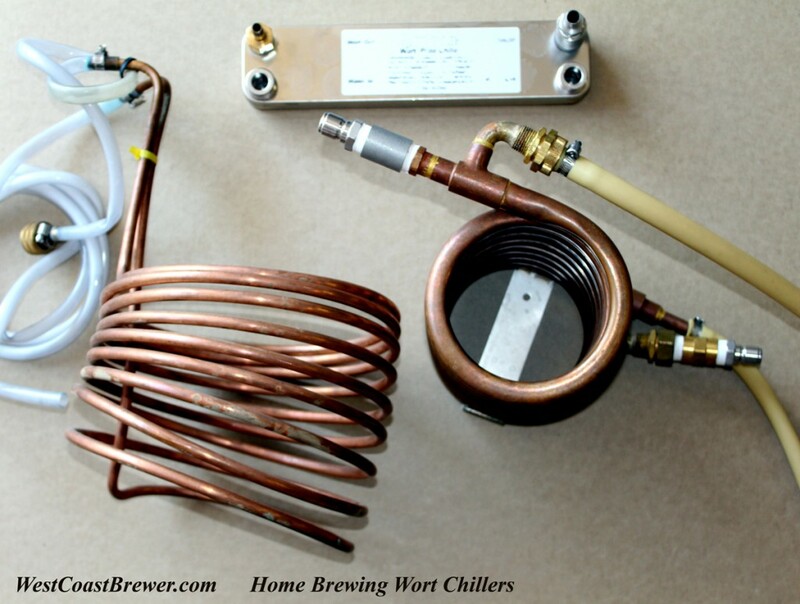 There are three typical types of home brewing wort chillers. Immersion chillers are large coils constructed of copper or stainless steel. They are placed inside the brew kettle while cold water is pumped through the chiller, cooling the wort. Plate chillers are made of fused plates and have channels where the cold water is pumped in from one end, causing it to intersect with the plates being heated by the wort from the other end, which rapidly cools the wort. Lastly, counter flow convolution chillers have hot wort flowing through one tube as chilled water passes over it from the opposite direction in a surrounding tube. I personally prefer the counter flow convolution chillers because they permit me to cool my wort quickly while also being easy to clean, since hops and trub are less likely to get lodged in the tube than they are in a plate chiller. 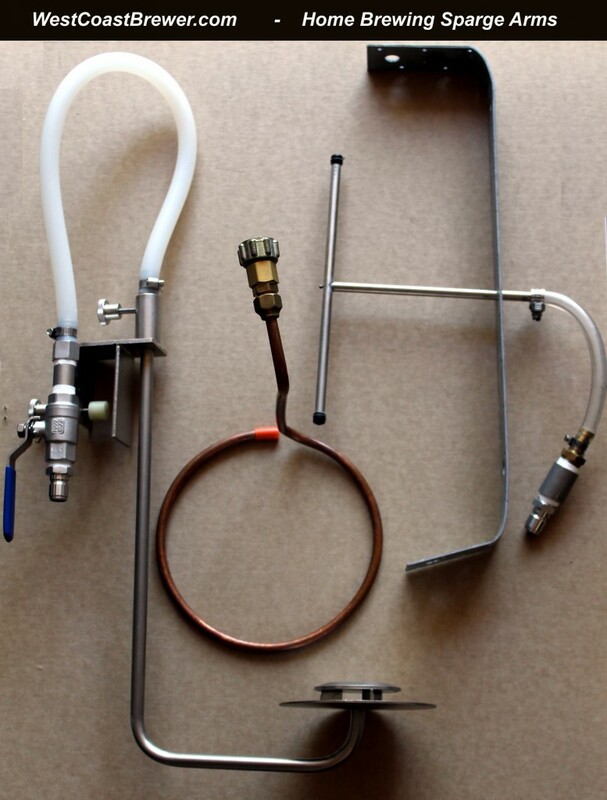 Below is a photo of three examples of home brewing wort chillers: an immersion chiller, plate chiller and a counter flow convoluted chiller. A sparge arm is a piece of brewing hardware used to flush the grain bed with hot water in order to extract any residual sugars left behind in the mash. The sparge arm water needs to be in the range of 168° F in order to liquefy the remaining sugars; if the temperature exceeds 170° F, the brewer many risk pulling excess tannins from the grain husks and causing off flavors and chill haze in the finished beer. Sparge arms are typically constructed of copper, stainless steel, or plastic, and should have some form of flow control so that the approximate flow rate can be set to keep pace with the flow of wort leaving the mash tun (or lauter tun) and heading to the boil kettle. 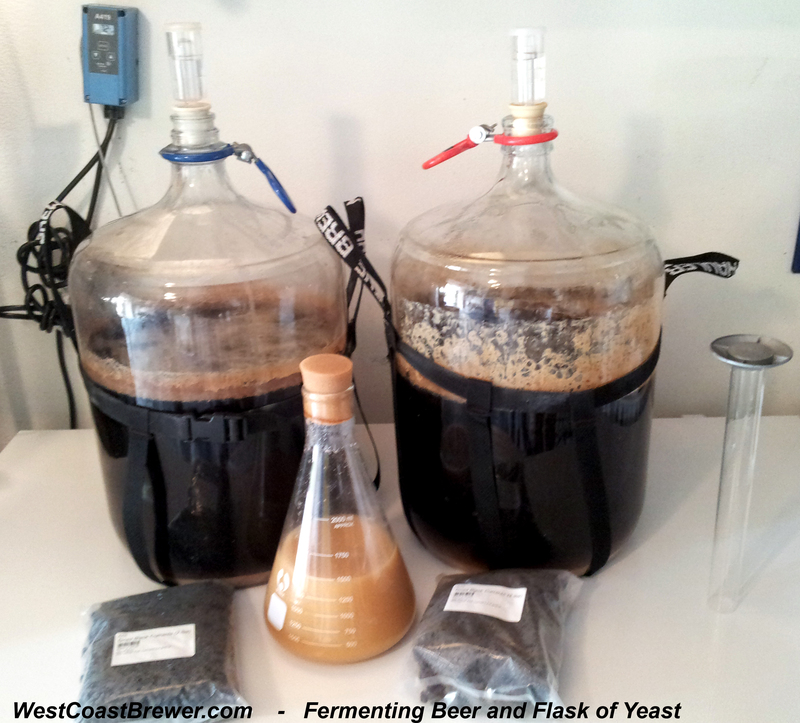 Below are three examples of home brewing sparge arms. From left to right, there is a MoreBeer.com “Ultimate Sparge Arm,” a rigid copper sparge arm, and a fly sparge arm with a stainless bracket. I have used each one of these and am currently using the MoreBeer.com sparge arm due to its versatility, which allows me to integrate it into my RIMS system. Brewing yeast strains are unicellular fungi that convert simple sugars into approximately equal parts of alcohol and carbon dioxide during the fermentation process. There are two main types of beer yeast varieties: saccharomyces cerevisiae, which is a top fermenting ale yeast, and saccharomyces pastorianusis, a bottom fermenting lager yeast. 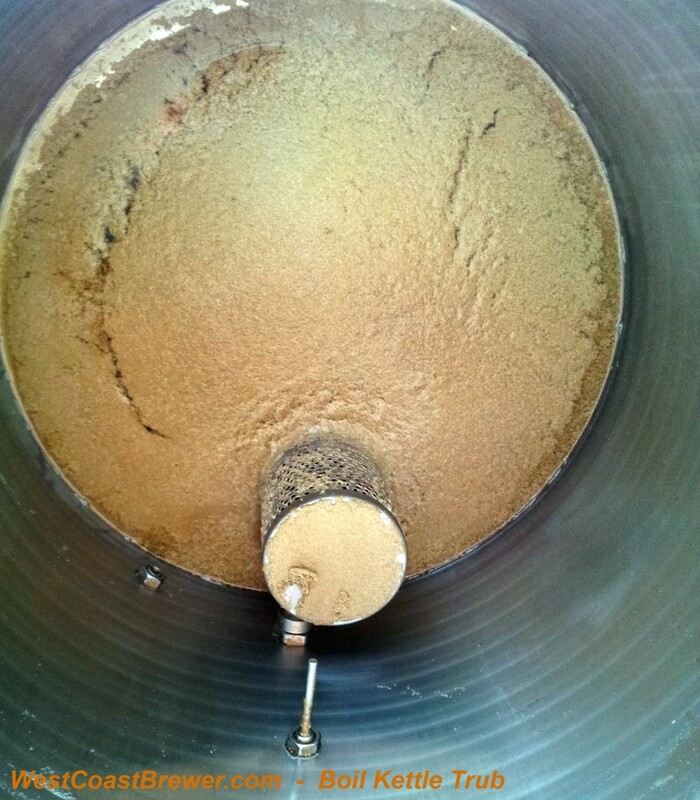 Wort is the name given to the sugar rich liquid that is extracted from the mash prior to fermentation. Prior to the boil, when the hops have not yet bittered the wort, it is known as sweet wort. After the boil but prior to fermentation, it is known as bitter wort since the beta acids from the hops have imparted a bitter flavor upon it. Wort (unfermented beer) being transferred after sparging. 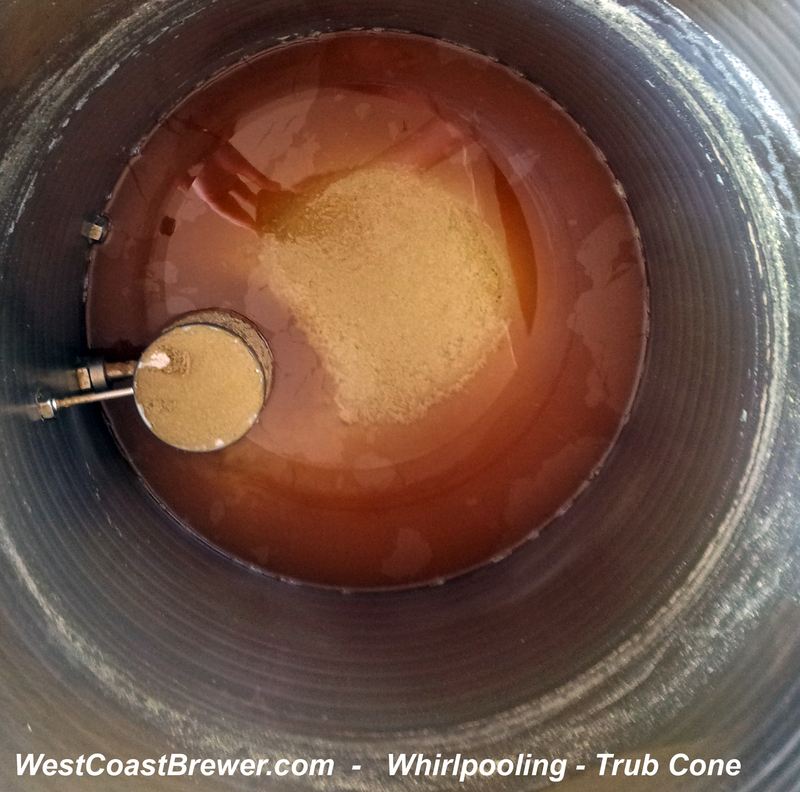 Whirlpooling is the process of separating the trub from the wort by utilizing centrifugal force to confine the trub to the center of the kettle so the wort can be drawn off without disturbing the trub cone. 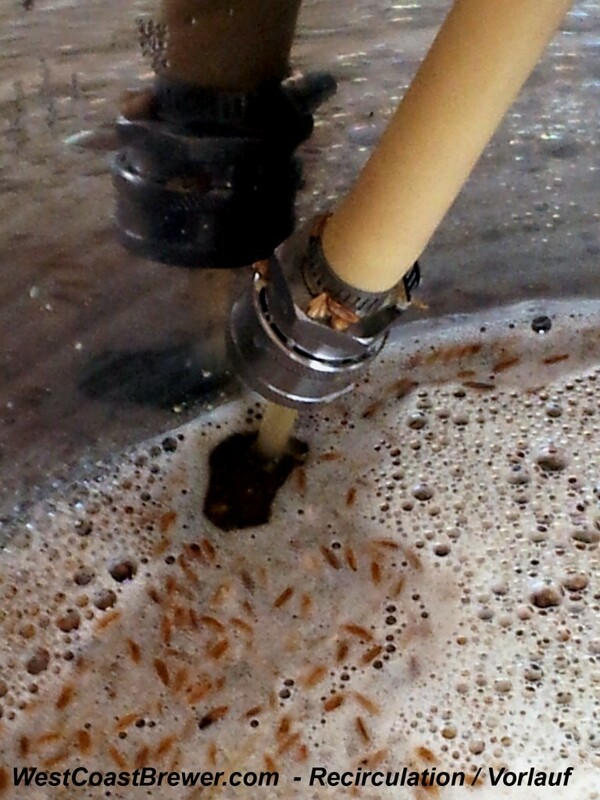 Whirlpooling can be achieved by quickly moving the wort in a clockwise or counterclockwise motion until a vortex begins to form in the center of the kettle. Once the vortex has formed, the trub will begin collecting and settling into the center of the kettle, forming a cone as the spinning wort forces the denser particulates towards the center. It is important to allow 15 to 20 minutes for the cone to form before drawing the wort from the kettle. If you are using an immersion chiller, you would want to chill the wort prior to whirlpooling and then draw the wort out slowly as not to disturb to trub cone. 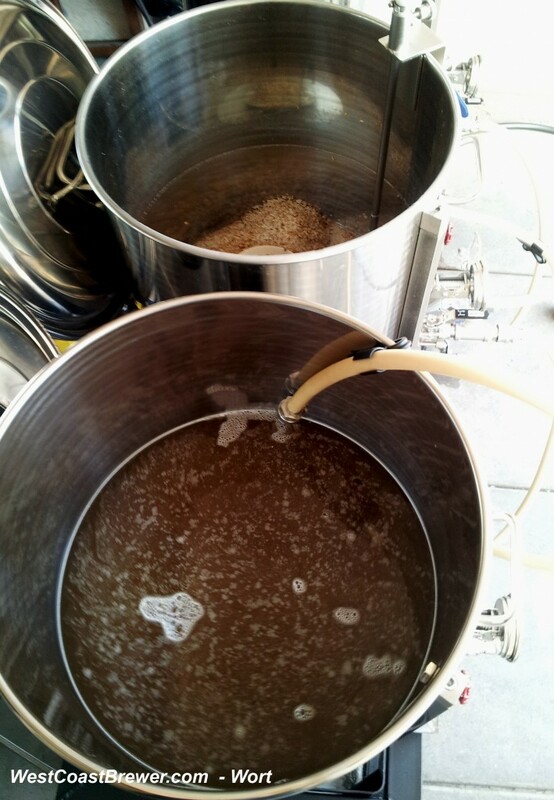 Photo of a 20 gallon boil kettle after the boil had completed and the wort had been whirlpooled and much of the wort had been drawn off. Vorlauf comes from the German word for mash recirculation. Vorlauf is the process of pulling the wort from the base of the mash tun or lauter tun and recirculating it back on to the top of the grain bed. Vorlauf typically occurs after the end of the mashing process. As the hot wort is recirculated through the grain bed of the mash, the grains act as a particle filter, clearing the wort. As the wort is recirculating, it becomes cleaner and less turbid until finally it is clear and ready to be passed to the boiling vessel. A pump is typically used to recirculate the wort at a steady and controlled pace. In the case where a home brewer does not have a pump available, the wort may be drawn into a container and slowly poured back on top of the grain bed. This process can be repeated until the wort has become clear. Additionally, rice hulls may be added to a mash as a means of boosting the filtration capability of the grain bed. Turbidity is haziness or cloudiness in beer or wort. It is caused by the suspension of particulate matter in the fluid. In order to remove the turbidity of wort in the mash or lauter tun, it is recommended that you recirculate the wort over the grain bed, which will act as a particle filter. Recirculation is a great method of clearing the wort prior to sending it to the boil kettle. Trub or hot trub is the excess material left in the boil kettle after the wort has been transferred. Boil kettle trub typically consists of hop matter, grain fiber, tannins, and the dense proteins known as the hot break that combine during the first 15 minutes of the boil, and ultimately drop to the bottom of the kettle. It is recommended that the trub not be transferred to the fermenter, as it may impart off flavors on the finished beer. The trub that was left over in the boil kettle after the boil took place and the wort was transferred into fermenters. Top fermentation, or top fermenting, describes the tendency of ale yeast cells to conduct the majority of fermentation on the surface of the fermentation vessel as opposed to the bottom, as is common with lager yeast. Top fermenting ale yeast is typically fermented at a temperature range between 65° F and 75° F; the lower the temperature, the slower the fermentation is carried out. Excessive fermentation temperatures have been known to generate off flavors in beer, and that is why a temperature range of 65° F to 75° F is typically recommended. When a top fermenting ale is most active, a thick head of foam known as a krausen forms on the top of the fermentation vessel and will subside as the fermentation draws to an end. The length of fermentation is dependent on the health of the yeast, the original gravity of the wort, the temperature of the fermentation and the amount of yeast pitched, but typically takes anywhere from one week to three weeks for the majority of fermentation activity to complete. A secondary fermentation is oftentimes conducted so that any remaining fermentable sugars can be converted to alcohol, and the beer can condition and allow the yeast to precipitate to the bottom of the fermenter in preparation for bottling or kegging. 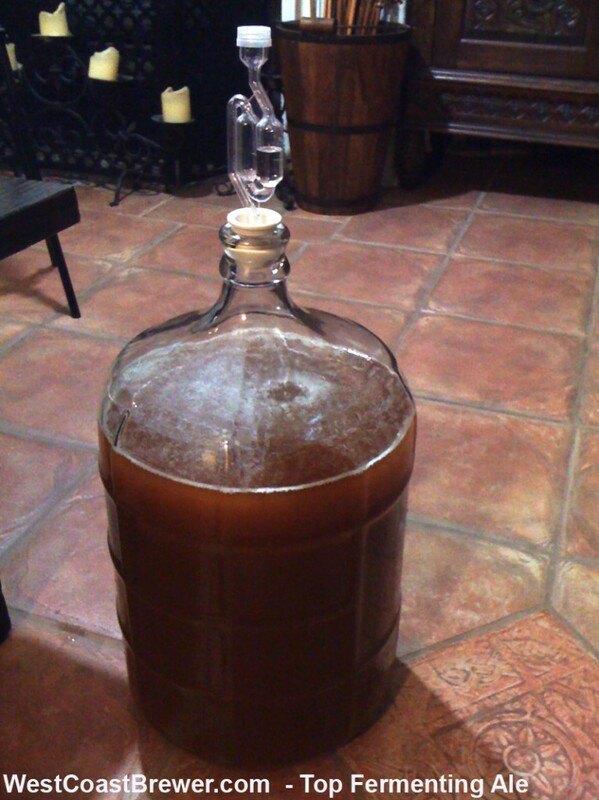 Below is a photo of a top fermenting ale that was recently transferred to a secondary fermentation carboy. Tannins are organic compounds found in the husks’ grains. Excessive tannins are almost always considered to be a flaw in beers and are interpreted as a harsh astringent bitterness or a mouth drying sensation. Excessive tannins are typically caused by too high of a mash pH or excessive temperatures during mash out or sparging. Tannin extraction is dramatically increased when mashing or sparge water temperatures exceed 170° F. Please also note that as the lautering and sparge process comes to a finish, the pH of a mash is increasing, which compounds the potential for tannin extraction. In addition to the off flavors created by tannins, they can also be significant contributors to chill haze in a beer. Hops release tannins into beer, but the hop tannins are not considered to be significant contributors off flavors or chill haze. Ways of removing excess tannins from beer including cold crashing, or cold conditioning the beer at approximately 34° F for two or more weeks. That should cause some of the excess tannins and proteins to precipitate out of the beer onto the bottom of the fermenter or conditioning vessel. You may also use a beer a beer fining agent such as gelatin or isinglass to help clear the tannins. Step infusion is a beer mashing method where differing temperatures and quantities of water are infused in the mash tun from the hot liquor tank at specific intervals or steps in the mash process to control sugar conversion and extraction.